The route guide and maps have not been divided into rigid daily stages since people walk at different speeds and have different interests. 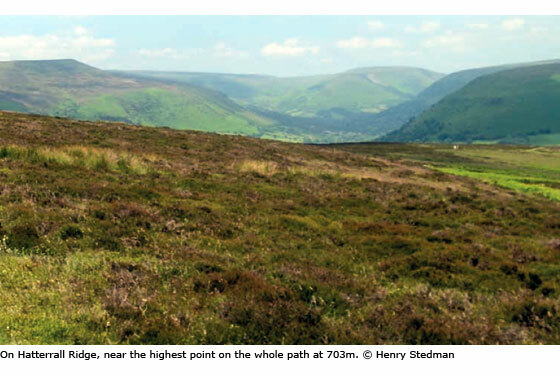 Some sections fall naturally into full days such as Knighton to Kington but more often the choice is up to the walker. The route summaries below describe the trail between signifi- cant places and are written as if walking the path from north to south. To enable you to plan your own itinerary practical information is presented clearly on the trail maps. This includes walking times, places to stay, camp and eat, as well as shops where you can buy supplies. Further service details are given in the text under the entry for each place. For an overview of this information, see pp32-5. The trail maps are to a scale of 1:20,000 (1cm = 200m; 31/8 inches = one mile). Walking times are given along the side of each map and the arrow shows the direction to which the time refers. Black triangles indicate the points between which the times have been taken. See note on walking times in the box below. The time-bars are a tool and are not there to judge your walking ability. There are so many variables that affect walking speed, from the weather conditions to how many beers you drank the previous evening. After the first hour or two of walking you will be able to see how your speed relates to the timings on the maps. The trail is shown as a dotted line – – –. An arrow across the trail indicates the slope; two arrows show that it is steep. Note that the arrow points towards the higher part of the trail. If, for example, you are walking from A (at 80m) to B (at 200m) and the trail between the two is short and steep it would be shown thus: A– – – >> – – – B. Reversed arrow heads indicate downward gradient. Accommodation marked on the map is either on or within easy reach of the trail. The details for each place are given in the accompanying text. The number of rooms of each type is stated, ie: S = Single, T = Twin room, D = Double room, Tr = Triple room and Qd = Quad. Note that most of the triple/quad rooms have a double bed and one/two single beds (or bunk beds). Consequently for a group of three or four, two people would have to share the double bed but it also means the room can be used as a double or twin. Rates quoted for B&B-style accommodation are per person (pp) based on two people sharing a room for a one-night stay; rates are usually discounted for longer stays. Where a single room (sgl) is available the rate for that is quoted if different from the rate per person. The rate for single occupancy (sgl occ) of a double/twin may be higher, and the per person rate for three/four sharing a triple/quad may be lower. At some places the only option is a room rate; this will be the same whether one or two people (or more if permissible) use the room. See box p21 for more information on rates. The text also mentions whether the bedrooms are en suite, or whether facilities are private or shared (in either case this may be a bathroom or shower room just outside the bedroom). A symbol in the text signifies that at least one room has a bath – either in an en suite room or in a separate bathroom – for those who prefer a relaxed soak at the end of the day. Also noted is whether the premises have: wi-fi (wi-fi); if dogs (see also pp27-9) are welcome in at least one room (often places only have one room suitable for dogs), or at campsites, subject to prior arrangement, and any associated charges and requirements; and if packed lunches (L) are available (these must almost always be requested in advance – ie by, or on, the night before). If arranged in advance many B&B proprietors are happy to collect walkers from the nearest point on the trail and deliver them back again next morning; they may also be happy to transfer your luggage to your next accommodation place on the map. Some may make a charge for either or both of these services. Check the details at the time of booking. Features are marked on the map when pertinent to navigation. In order to avoid cluttering the maps and making them unusable, not all features have been marked each time they occur.